is an architect, art theorist and, since 2010, rector of Städelschule and director of Portikus in Frankfurt/Main. Before that, he was professor at Architectural Association School of Architecture, London, and visiting professor at Penn University, Philadelphia. 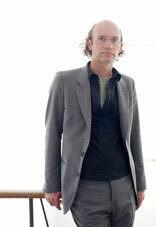 His latest projects focus on the development of concepts for art institutions such as European Kunsthalle in Cologne (2006–2008), unitednationsplaza in Berlin (together with Anton Vidokle, 2006–2008), Cybermohalla Hub in Delhi, Cultural Agencies in Istanbul and a studio structure in The Land/Thailand. Hirsch is the author of On Boundaries and Institution Building (both published by Sternberg Press). In recent years, more and more artists have created institutional frame conditions (e.g. entire houses, Internet platforms) or infrastructure facilities (e.g. cafés, libraries, schools, video archives). To what degree are these frame conditions and infrastructure facilities not merely functional tools but rather sculptures in their own right? In what way do these projects negotiate the boundaries between artistic, curatorial and architectural practice?